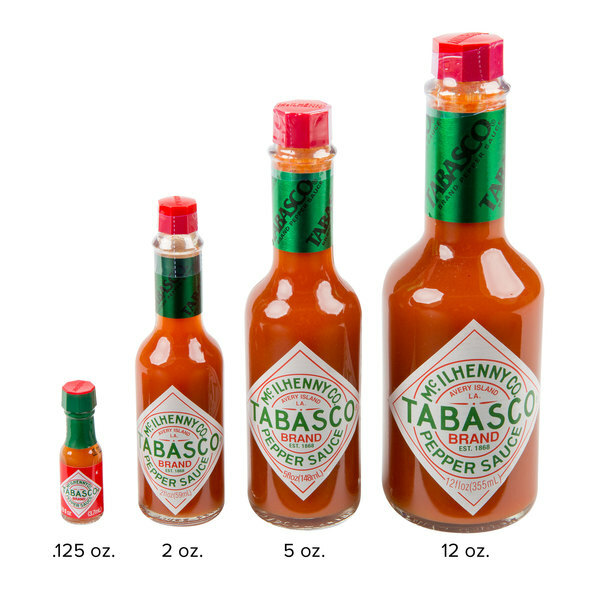 TABASCO® .125 oz. original hot sauce provides a quick and easy way to flavor your dishes! It's made with fully aged red peppers, distilled vinegar, and a pinch of salt. This simple yet fiery recipe has been a favorite ever since it was first introduced in 1868. Choose TABASCO® hot sauce for your restaurant or event, and your guests will recognize the brand name as one that stands for consistent quality and taste! 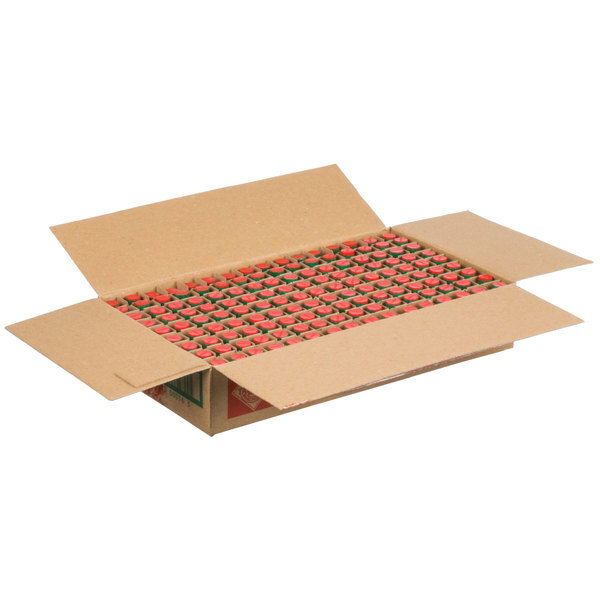 One of the best parts of TABASCO® original hot sauce is its versatility with a maximum of 5,000 heat units. Just a few drops will enhance sandwiches, soups, chicken, and burgers. In fact, it also acts as the perfect secret ingredient to make your signature sauces, marinades, and glazes even better! Try adding this hot sauce to Bloody Marys, eggs, or creamy hollandaise sauce for brunch offerings. No matter how you use it, the hot, peppery flavor makes an excellent addition to any meal. This petite .125 oz. bottle is great for portion control in the front of the house. Use it for room service or restaurant take-out, and customers will love the look of this single serving mini bottle! 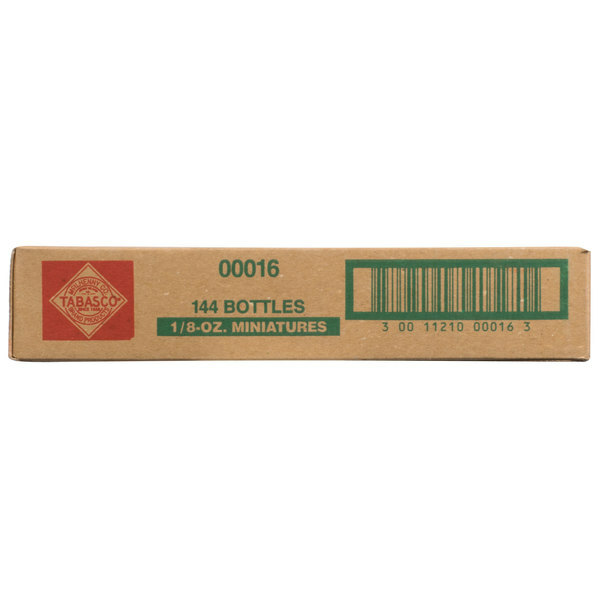 Tabasco original hot minisauce bottles are so great to pack for Togo orders! They are mini glass bottles that have a nice look and is the perfect amount. 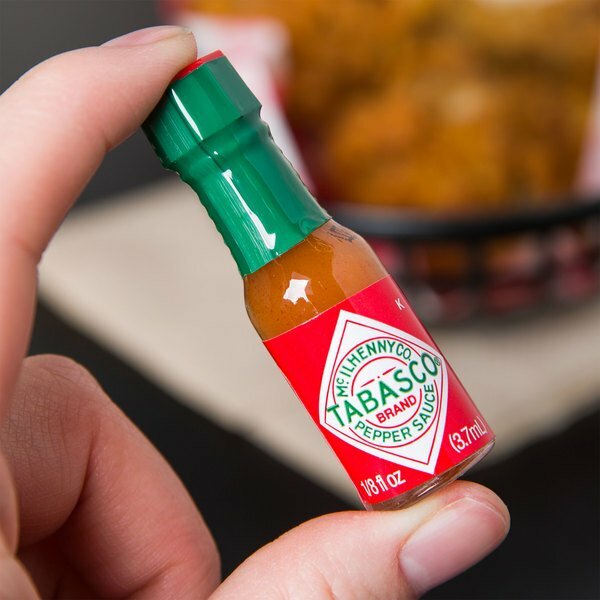 These are the perfect size of tabasco sauce to give out on to go orders. I like using the little ones when we do oysters for the family. Love these small baby bottles of TABASCO sauce that are great for our parties. Everyone can have their own and make great little favors too. 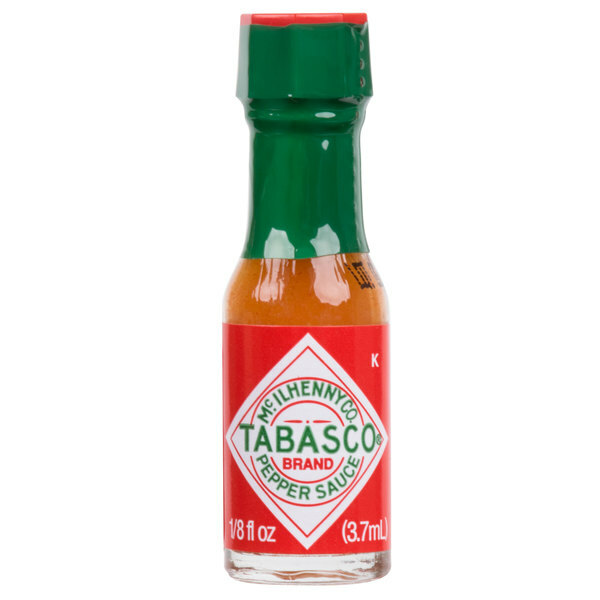 Tabasco has a one of a kind flavor that enhances anything in small amounts. I love that these can fit in my purse and go everywhere that I do. A great brand of hot sauce and everyone loves TABASCO. The sauce has a nice flavor and the mini bottles are excellent for serving on buffets. The best hot sauce on the market and has the best taste too. 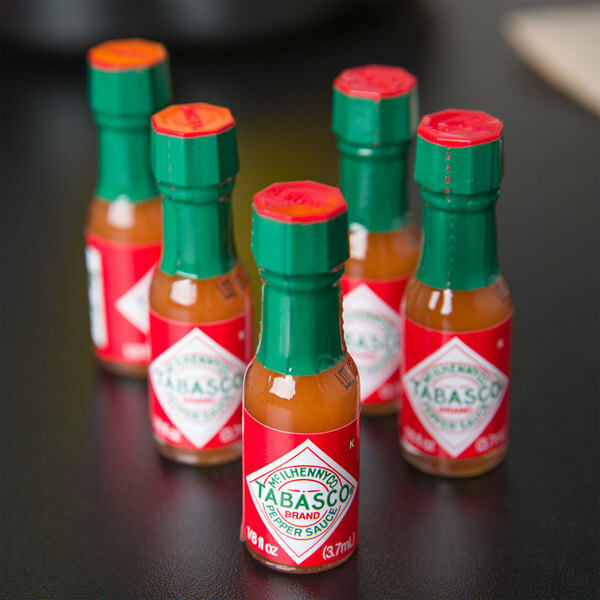 The Tabasco hot sauce is wonderful and love these mini bottles for stocking stuffer ideas. It’s hard to beat Tabasco. This is a great product to have on hand. I love that I can take it with me wherever I go. 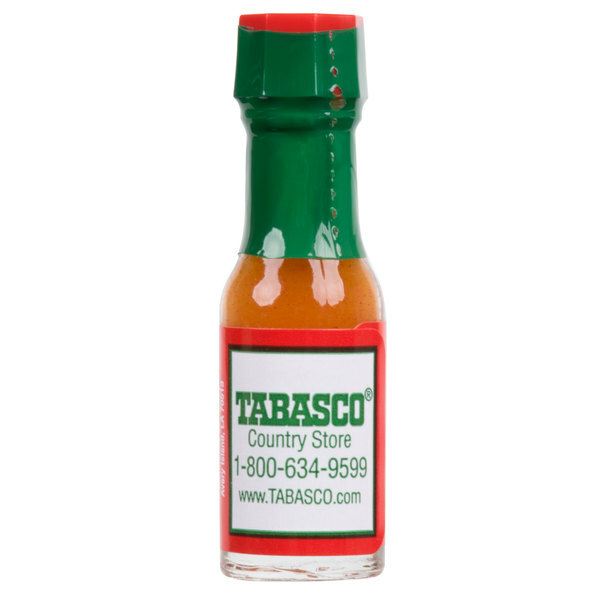 The TABASCO hot sauce is great and very well known brand. We buy these mini bottles every year for our company Christmas party. We do an oyster cook and these are great for everyone to have their own bottle. The sauce is wonderful. The TABASCO brand hot sauce is so delicious. I love the great taste and the wonderful flavor. The mini bottles are perfect for parties and events. I love Tabasco hot sauce. I love these miniature bottles and the convenience they bring with them. You can carry them with you anywhere which is nice. Sriracha is a great brand of hot sauce that most people love. These jars are very very small but since you only need a dash or two in your dish they're pretty perfect. Everything mini is cute! These mini bottles of classic Original Tabasco Hot Sauce are tiny and fun. You get the classic great taste of Tabasco, that people know and love, in a precious package. Perfect for gift bags or sets.